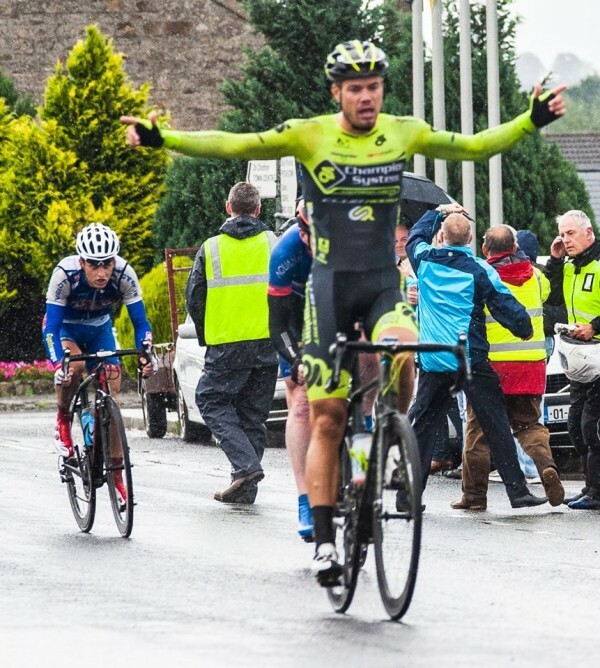 Dillon Byrne has taken a brilliant win and holds the yellow jersey after stage one of the Suir Valley Three Day today. 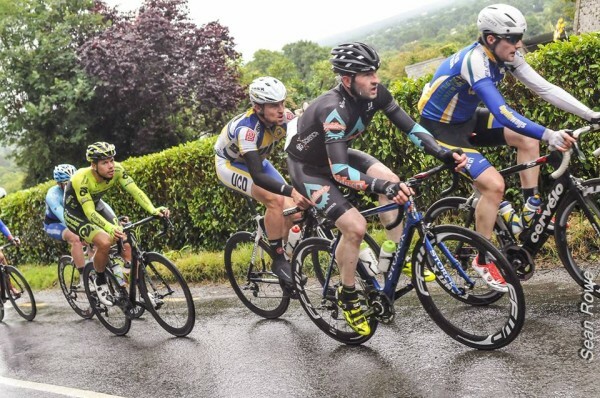 In truly biblical conditions, the Champion System-MaxGear rider edged out Bryan McCrystal (Aquablue A) and Mark Dowling (DID Dunboyne) in the sprint at the end of the 116 kilometre stage which was punctuated by three climbs. Byrne was in all the day’s major moves, but it was not until around 40 kilometres in, after the first climb at Portlaw, that a move clipped off the front. In it were Byrne, McCrystal, Paddy Clarke and Chris Reilly (Liquidworx-Fitscience), Eoin Morton and Colm Cassidy (UCD CC), Seb Bayliss (Champion System-MaxGear), Mark Dowling and Javan Nulty (DID Dunboyne) and Ben Kellett (Champion System-MaxGear). That group worked very well together and managed to pull out a gap of 40 seconds initially, before some concerted chasing from the peloton began. But into a strong headwind it proved futile, though the Carrick duo of Michael O’Loughlin (Standard Life Nicolas Roche performance Team) and Sean Hahessy (Iverk Produce Carrick Wheelers) went off together in pursuit. At Pilltown the 11–man break was still clear with Morton and Clarke going all out for KOH and sprint points respectively. Reilly dropped out of the break on the final KOH of the day to leave it 10 up front, while Kellett was also distanced, making nine leaders on the run for home. Behind, a good dozen or so riders jumped away with around 20 kilometres to go and they worked very well. The Nicolas Roche Performance Team had three riders there; Aaron Swan, Michael O’Loughlin and David MCCarthy. Between them they would take home two jerseys, with Swan taking the A3 prize and McCarthy the A2 lead. Up front, the break began to splinter with the eventual podium and Colm Cassidy going clear, leaving five behind. Byrne showed he was the strongest on the punishing uphill sprint and was understandably delighted to wear the first yellow jersey of the race. “I’m very happy with the result, the stage win, and of course the yellow jersey,” beamed the Blackpool man. “I’m not so much surprised but happy. I did say I wanted to win the race, so I can’t be surprised. But I also couldn’t have done it without the team; they all rode very well, we covered everything, and were very active all day. “There was a group of about 12 to 15 riders away early on and we worked well, including two of my guys. I just clipped off the front on a descent and bridged across on my own, so I wasn’t the one who instigated the actual break. “But when I got across I went straight on the front, and started driving it to get the gap out. “This race has been my main aim as well as the An Post Rás back in May, but I was injured from a crash for that so had to miss it. I’ve been really trying to get fit again for this. Tomorrow’s morning stage takes the riders 92 kilometres and there are three climbs again. Last year, it was the stage where Sam Bennett went into yellow when he bridged across to a break and successfully defended it for the remaining stages. This entry was posted in SV3 News. Bookmark the permalink.